Get ready for disruption: If current trends continue, bookstores will surpass comic shops by the end of the decade. While the dollar value of the comic market was up about 5% in 2016, to $1.085 billion, that growth was driven almost entirely by graphic novels in bookstores. 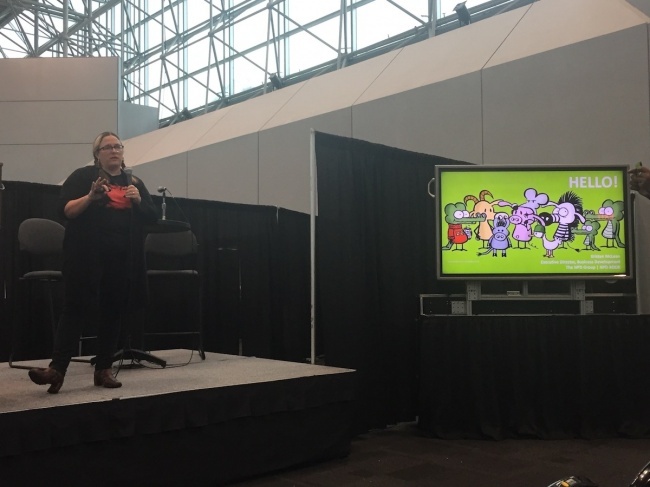 At the ICv2 Insider Sessions at New York Comic Con Milton Griepp presented a White Paper that included a detailed look at the state of the comics market in 2016, and Kristen McLean of NPD discussed the rapid growth of graphic novels, especially children's titles, in the book channel as tracked by BookScan (which includes bookstores, mass market stores, and online retailers such as Amazon). 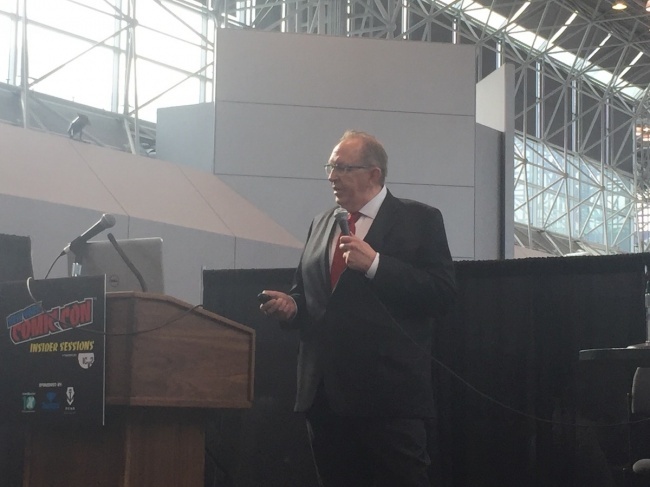 White Paper: Direct Market Flat, Book Channel Up: In his White Paper, Milton Griepp concluded that in dollar terms, sales of periodical comic and download-to-own digital comics were flat, while graphic novel sales were "exploding." 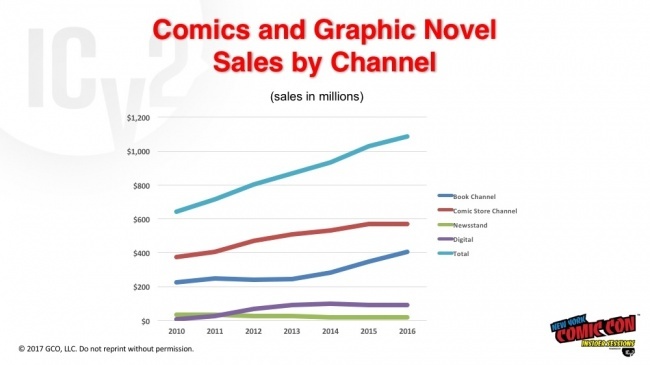 And sales of graphic novels are growing faster in the book channel than in the direct market. In terms of market share, the book channel went from 28% to 37% of the market from 2013, while comic shops dropped from 59% to 53%. Digital comics went from 10% to 8%, and the newsstand share stayed small, going from 3% to 2%. 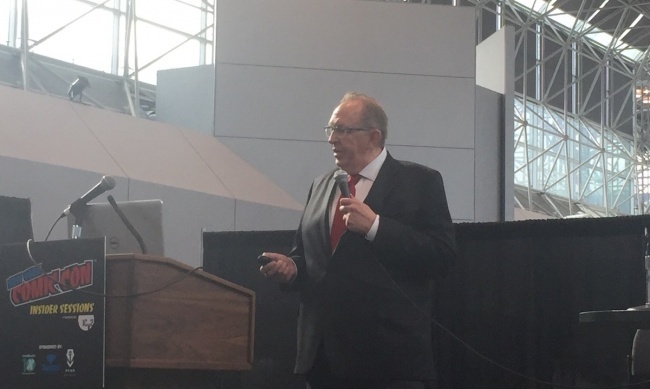 If these trends continue, Griepp said, the channels will flip: book channel sales will match direct market sales in 2019 and exceed them in 2020. In fact, the trends look even sharper in 2017. As was reported today, comic store comics and graphic novel sales are down 10% through September (see "Comic Store Sales Declines Moderate"). The downturn in the direct market is led by Marvel, which has seen sales decline due to a number of factors: Changes in their legacy characters, changes in numbering (a new #1 issue is an opportunity for readers to jump on, but also to jump off) and event fatigue. In addition, traffic in comic shops is down. Still, Griepp said, "Don't panic!" The direct market is still fundamentally healthy, he said, and change is driven by improvements in content, which Marvel has been working on. 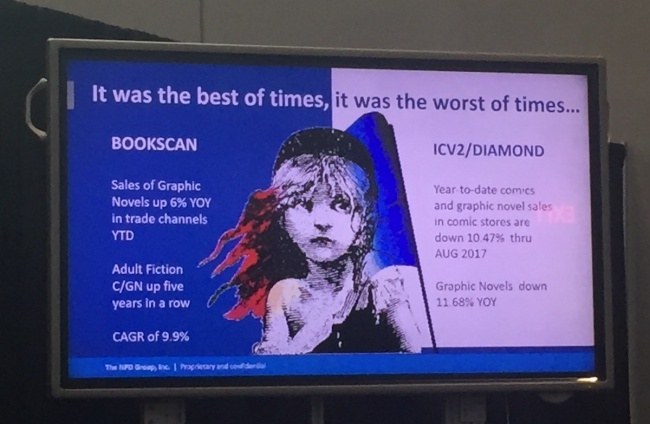 At the same time, graphic novel sales in the book channel continued to grow in 2017, and readers are coming to the format from different places—he pointed to Trayaurus and the Enchanted Crystal, by YouTube star Dan TDM, and Jomny Sun's Everyone's a Aliebn When Ur a Aliebn Too, a book that grew out of a Twitter account; the latter was the top selling graphic novel in the book channel this past summer. NPD: Strong Growth in the Book Channel: Kristen McLean of the NPD group (formerly Nielsen BookScan) took the podium later that day to discuss who is buying comics and graphic novels, and why. NPD tracks sales through BookScan and other channels and also does consumer and market research. McLean described the graphic novel market as "A Tale of Two Cities"—while sales are down in the direct market, as Griepp had noted, comic and graphic novel sales saw a 25% growth in the book channel, for a compound annual growth rate of 9.9% over the past five years. That also compares favorably to the overall book market (all types of books), which has been relatively flat. In that context, she said, 9.9% was "phenomenal." Looking at the market in terms of units (not dollars, as Griepp had), McLean noted that comics and graphic novel sales were up 25% between 2015 and 2016 and 6% from 2016 to 2017, for an overall compound annual growth of 15% for that period. "A lot of that is being driven by children's comics and graphic novels," McLean said. "This is one of the big differences between the book and the direct market side." 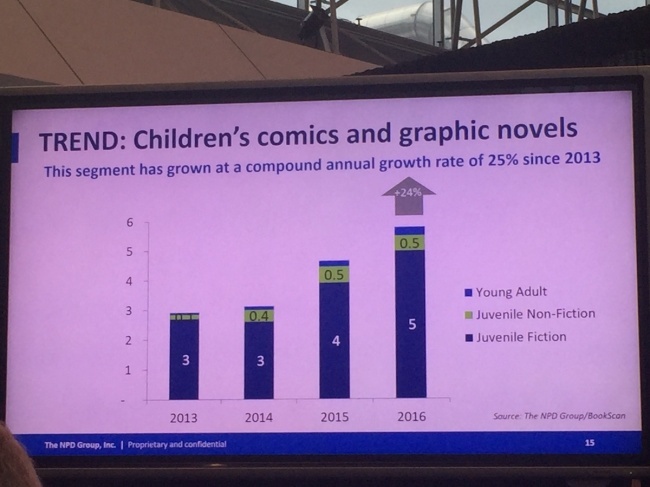 In fact, children's comics and graphic novels had a compound annual growth of 25% since 2013. "One of the questions that I have is how we are going to bridge the knowledge gap and the sales gap between the two parts of the market," McLean said. "We are in a channel shift, we are in an audience market shift right now, and we've got two pretty radically different engineered sides of the market. A publisher like Scholastic, which is used to playing the trade channel, does great, but there are a lot of amazing publishers that primarily are working in the direct marketplace who would love to have an opportunity to break in, but I think the question is, are they engineered for it? Do they understand how to do it? There are some pretty powerful mechanisms on the trade side that I think we have to address." Complicating the picture, she added is the fact that the chain bookstores are under stress and shelf space is shrinking.